When it comes to gorgeous, incredibly effective covers, these three sort of hit it out of the park. Vintage Classics knows how to package a book is all I can say and I want--no, I need--these three editions in my personal library. Covers, both good and bad, have been on my mind lately and these examples just go to show what magic can happen when you let talented graphic designers who've--wait for it--Read. The. Books. create new, attractive, and inventive covers. 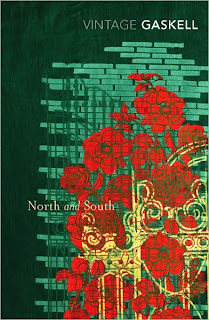 All it takes is a glance at the twining roses set against the brick wall backdrop on this cover of North and South to send me into John-and-Margaret raptures. 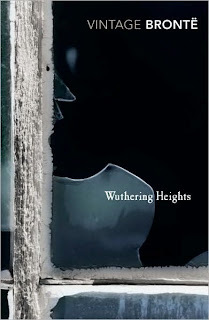 Similarly, the broken windowpane on Wuthering Heights instantly evokes Cathy's ghost calling out his name. As for Jane Eyre, the silhouette is perfect and I want to go re-read it right now. When you get a chance, wander on over and check out their complete catalogue. I'm a particular fan of vintage Dracula. That North and South cover really is too perfect isn't it? Need. Want. I think these vintage covers are fantastic. Long time fans will want these on their shelves, but really... what a way to capture the attention of some new readers of the classics, don't you think? Brenda, it really is too perfect. And I hear ya. The sheer volume of books I've never read overwhelms me all the time. Michelle, so do I. So. Do. I.
Chelle, grrr. Sorry! I ended up gazing at so many of their titles. Lovely stuff. Heather, I know. The booklust...it grows. Christine, exactly! They work so well on so many levels. I would have loved them as much at 17 as I do now. Jenny, not dumb at all! It's so Jane. And so human. Yet still beautiful.